George Washington was a U.S. military leader, statesperson, and the first president of the United States from 1789 to 1797. A leader of mythic proportion in U.S. history, Washington's leadership from the American Revolution (War of Independence) to the end of his presidential administrations proved crucial to winning independence from Great Britain and establishing a national union of states based on the U.S. Constitution. Washington was born on February 22, 1732, in Westmoreland County, Virginia. Born into the colonial aristocracy, Washington attended local schools and supplemented his formal education by reading widely. As a young man he became a surveyor, and in 1749 he was appointed county surveyor for Culpeper County, Virginia. In 1752, at the age of twenty, Washington inherited the family estate at Mount Vernon and embarked on a military career. During the French and Indian War, Washington gained his first military experience. The war was fought to determine whether France or Great Britain would rule North America. In 1753 Washington requested and received the assignment of delivering an ultimatum to the French, ordering them to retreat from the Ohio Valley. The French refused, and Washington led troops against them. Although Washington won an initial victory in 1754, the French counterattacked in force and Washington had to surrender his camp at Fort Necessity, Pennsylvania. He resigned his commission, but in May 1755 Washington became an unpaid volunteer, serving as aide-de-camp to the British general Edward Braddock. Braddock was ambushed and killed later that year near Fort Duquesne, and Washington himself narrowly escaped. In August 1755 Washington was promoted to colonel and given command of the Virginia militia, which defended the western frontier of the colony. During the remainder of the war, Washington successfully protected the frontier. In 1759 Washington returned to Mount Vernon, where he married Martha Custes, a young widow with a large estate. The marriage made Washington one of the wealthiest men in Virginia. He was elected to the Virginia House of Burgesses in 1759, serving until 1774. During this period, colonial anger at British taxation and control began to steadily build. Great Britain believed that the taxes were justified to help repay the war debt and recognize British efforts to successfully remove France from North America. Washington, like many other colonial leaders, joined the protest against British interference and in 1774 endorsed the Fairfax Resolves, which called for a stringent boycott of British imports. In 1774 and 1775 he attended the first and second continental congresses as a delegate from Virginia. In 1775, as the Revolutionary War was imminent, the Congress appointed Washington commander in chief of the American forces, which were known as the Continental Army. It was hoped that Washington's appointment would promote unity between Virginia and New England.Washington's years as commander in chief were a mix of defeats and victories. In March 1776 he successfully forced the British out of Boston, but in August the British defeated his forces at New York City. Washington then sought safety in New Jersey and emerged victorious again with his surprise attack on Trenton on December 25, 1776. On January 3, 1777, Washington's troops defeated the British at Princeton, New Jersey. The two victories were critical to maintaining colonial morale, and by the spring of 1777, more than eight thousand new soldiers had joined the Continental Army. The tide turned, however, in September 1777, when Washington unsuccessfully tried to stop British forces from advancing on Philadelphia at the battle of Brandywine Creek. After the British occupied Philadelphia, Washington made a futile attack at nearby Germantown. During the winter of 1777 and 1778, Washington's troops stayed at Valley Forge, west of Philadelphia. The conditions were adverse, requiring all of Washington's leadership skills to hold his army together. During the winter his actions aroused dissent in Congress, and his critics sought to have General Horatio Gates replace Washington as commander in chief. Several congressmen and military officers backed Gates, but the public rallied behind Washington. In June 1778, Washington attacked the British at Monmouth, New Jersey, but again was defeated. He then shifted his military strategy, keeping his troops encamped around British forces in Connecticut, New York, and New Jersey. In 1781 Washington defeated General Charles Cornwallis at the Battle of Yorktown in Virginia. The surrender of Cornwallis marked the end of major military actions in the Revolutionary War. The signing of the Treaty of Paris in 1783 officially ended the conflict, with Great Britain recognizing the independence of the thirteen colonies and the geographic boundaries of the new nation. "Liberty, when it begins to take root, isaplant of rapid growth." After the war Washington returned to Mount Vernon, but he was soon drawn back into politics. The Articles of Confederation proved ineffective for governing the national affairs of the thirteen states. Shays's Rebellion, named after its leader Daniel Shays, was an armed insurrection in Massachusetts in 1787 and 1788 that convinced U.S. political leaders that a strong national government was needed. Washington agreed and consented to serve as president at the Constitutional Convention of 1787 in Philadelphia. Though he played no part in the drafting of the Constitution and did not participate in behind-the-scenes political discussions, Washington's presence lent legitimacy to the effort to craft a new government. 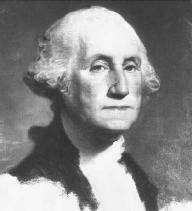 As the leading national figure, Washington was the logical choice to become the first president of the United States. His election in 1788 helped shape the Executive Branch of federal government. Washington decided to surround himself with a group of national leaders as his advisors and administrators. Though the presidential cabinet is not discussed in the Constitution, Washington's use of it made it a traditional part of a president's administration. The first cabinet included Thomas Jefferson as secretary of state and Alexander Hamilton as secretary of the treasury. Washington was sympathetic to Hamilton's belief that a strong national government was needed, including the establishment of a national bank. In contrast, Jefferson believed that the states should continue to be dominant, with the national government confined to the enumerated powers contained in the Constitution. The conflict between Hamilton and Jefferson dominated Washington's administration. Jefferson supported the French Revolution, whereas Hamilton favored British efforts to organize a coalition to topple the new regime through warfare. As events unfolded, Washington announced in the Neutrality Proclamation of 1793 that the United States favored neutrality in the war between France and the British coalition. U.S. neutrality clearly favored the British. When the French emissary Edmond-Charles Genet tried to recruit U.S. soldiers to serve as volunteers for the French cause, Washington had Genet recalled and repudiated the 1778 treaty with France. Jefferson opposed Washington's actions and resigned as secretary of state, causing a rift in the Republican Party and precipitating the formation of the Federalist Party, with Hamilton as its leader. Reelected in 1792, Washington faced domestic problems in 1794 with the Whiskey Rebellion in Pennsylvania. Organized as a protest against a federal liquor tax, the Pennsylvania uprising was quelled when Washington ordered the militia to maintain peace. In 1795 Washington faced opposition to the Jay Treaty with Great Britain, which John Jay had negotiated to settle commerce and navigation rights. One section of the treaty permitted the British to search U.S. ships. The treaty was adopted because of Washington's popularity, but both the president and the treaty were severely criticized. Washington did not seek reelection in 1796. In his celebrated "Farewell Address," he advised against "entangling alliances" with European nations. He returned to Mount Vernon, where he spent the rest of his years managing his estate. Washington died on December 14, 1799, at Mount Vernon. Marshall, John. 2000. The Life of George Washington. Indianapolis: Liberty Fund. Rozell, Mark J., William D. Pederson, and Frank J. Williams, eds. 2000. George Washington and the Origins of the American Presidency. Westport, Conn: Praeger. Shogan, Colleen J. 2001. "The Moralist and the Cavalier: The Political Rhetoric of Washington and Jefferson." Northern Kentucky Law Review 28 (summer). Zall, Paul M., ed. 2003. Washington on Washington. Lexington: Univ. Press of Kentucky. "Farewell Address" (Appendix, Primary Document); War of Independence. Lawrence Washington, George Washington's half-brother, was a major influence in George Washington's life and his mentor during George Washington's early military development. The event included Abraham Lincoln, George Washington, George W.
In Washington, George Bush and national security adviser Condoleezza Rice denied the new cabinet would be US puppets. The day after Mary Robinson stepped down as United Nations High Commissioner for Human Rights, forced out by determined pressure from Washington, George W.
Water remains a critical issue for hops and every other crop grown in Washington, George said. Written by Roger Wilkins, an assistant attorney general during the Johnson administration and a Pulitzer Prize-winning editorial writer for the Washington Post, the book looks at the words and deeds of four prominent founding fathers--George Washington, George Mason, James Madison and Thomas Jefferson--and explores the hypocrisies and intellectual constructs upon which much of their thinking, and the socio-political underpinnings of the nation they created, were based.